Disclaimer: This is a fan article written by forum member and long time Zelda Informer fan Emma, it in no way expresses the viewpoints of Zelda Informer as a whole. This particular article does not claim to definitively cover everything on the topic of animals in Zelda. For more information on fan articles, please check out our Article Submission Board. Zelda games are full of conventions. Things like items, bosses, locations and characters are often reused in new release to the series for consistency, nostalgia and possibly due to laziness on the developers side. 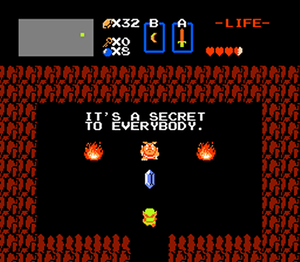 Animals in Zelda have had a bit of notoriety as campy, kind, and sometimes greedy, and this convention has not died. As early as The Legend of Zelda we had the silliest catch phrases coming from the most unlikely creatures. Sure, Moblins are monsters and not – by Zelda definition – animals, but they are still an interesting character in the original Legend of Zelda game. 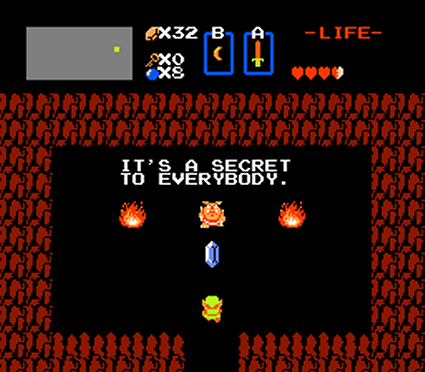 While the majority were evil, throwing spears at Link all through the Lost Woods and abroad, there were also a select few good Moblins who would give Link rupees while exclaiming, “It’s a secret to everybody.” It is an example of one the many classic Legend of Zelda catch phrases that has become an internet meme simply because of the campiness of the translation. Fast forward to A Link to the Past and we can now include the second animal characteristic, rupee fever! Who can forget Kiki the monkey? That greedy little monkey will open up the first dungeon in the Dark World for 110 plus rupees, depending on how many times you have to pay the 10 rupee deposit. Kiki wanted your money and he wanted it bad. He would run away if you just tapped an enemy while taking him through a perilous labyrinth in the dark world. Kiki was an entertaining little monkey without a doubt, and no doubt I’m not the only one who wanted to see more of him. My Kiki fan girling was much respected by Nintendo when Link’s Awakening was released. Link’s Awakening was the hub of all things animal. Kiki made a return again as an important character in story progression, requiring you to half finish the trading puzzle to get into the Darknut castle. The Animal Village full of quirky animals was introduced in Link’s Awakening, full of bears, hippos, and all kinds of crazy creatures. Perhaps the Animal village was in fact an asylum. On top of the Animal Village there was the Banana Crocodile, Mamu the frog king, Manbo the sunfish king, and the Walrus. Link’s Awakening is well known for its quirkiness and overly friendly characters, and the animals in this game certainly represent that to a tee. This is where things go downhill. Perhaps Link’s Awakening got a particularly bad response from its overall wacky characters, but it seems that Nintendo decided to scrap quirkiness for a little more realism for the release of Ocarina of Time. But Ocarina wasn’t immune from humor entirely, if you use the word in a loose sense. There is the talkative Kaepora Gaebora, every players worst nightmare when it comes to meaningless text and misguiding questions. More a nuisance than hilarious, this animal definitely brings back horrific memories of accidentally saying “No” when asked if I “Got all that?” Why couldn’t it always be the simple “Do you want to hear what I said again?” Myself, I much preferred those frogs up Zora’s River. Majora’s Mask had the return of the monkey characters. Similar in design to Kiki, these unnamed monkeys would run around the Lost woods and lead Link to the wounded Koume, again showing monkey’s helpful personalities, although it came free this time. Not a particularly memorable role, but at least Majora’s Mask had some monkey action going for it. Anyone who has played the Oracle games would be familiar with the characters Dimitri, Ricky and Moosh. In a single file, you would use each one of these furry friends to progress through the game. You also get the flute of one of the animals. Which animal you got depended on certain side-quests, whether you where playing Oracle of Ages or Seasons, and whether your file was a password file or not. Each animal was useful for different quests, but what made them most enjoyable was that depending on which one became your main friend, the scenery in a certain location would change to reflect that animal’s abilities. Moosh would cause large chasms which only he could traverse. Dimitri would cover the area in water and aquatic vegetation that only he could traverse. Ricky would create cliff faces that only he was capable of climbing. And also, they were crazy. In both games, getting Moosh often involved finding him some fruit to eat, Dimitri could be lifted and thrown about like a bowling ball and Ricky was a goddamn boxing Kangaroo! The Oracle games hold a special place in many player’s hearts, and they certainly brought the meaning of wacky animals back into Zelda after the rise of 3D gaming. The Wind Waker, like most 3D Zelda games, had scarce humorous animals, but one race of good ones comes to mind. The Fishmen were a pleasure to be around. Their random advice and funny voice acting made these characters very memorable in, and that was fitting considering you could meet them over 49 times. The fishmen were funny and nice, perhaps a tad greedy on the food, but still nice. 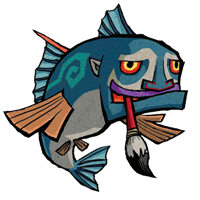 The Wind Waker’s design would have been a great format to incorporate crazy animals, but Nintendo decided to keep all randomness to the humans. After a significant drought of animals though the Four Swords series, Twilight Princess once again made the return of the monkeys. Again, they demonstrated their caring nature and, though they weren’t greedy for money, don’t put thievery and mischief behind them. Epona, though not debuting in Twilight Princess took a major role as an animal character, but delivered nothing in the quirky department. That was done by the various squirrels, frogs and whatever other animals Wolf Link could talk to. Their conversations ranged from being about how all animals help each other out, to others being jealous of Link’s shiny fur coat, and even to the thievery of Telma’s cat, Louise. Despite Phantom Hourglass having very few, if any, humorous animals and animal references, Spirit Tracks had one which stood out quite well. The Rabbitland Rescue man, strictly speaking, he is technically not an animal, but his quirkiness and appearance would have some players thinking otherwise. Unfortunately this is where it ends. While the Zelda series had its animal peak on the Game Boy and slowly gained an equilibrium, it has began to phase out. Twilight Princess gave hints at the concept reappearing, but it was not so. Today, where does this leave us? Well, with no obvious sighting of humor through animals or animal companions in the future. Animals have entertained, become memes, and even helped us beat Ganon, and yet, they receive no love from Nintendo. This writer, for one, hopes for more comic relief in the form of deranged flying bears, and crazy money-hoarding monkeys. Maybe hope is all I can do.